Our ongoing efforts to improve Salter Grove has been featured in an article in the Warwick Post, along with quotes from Rep. Joseph McNamara and FoSG member Jason Major. According to the article, written by Rob Borkowski, McNamara said Lisa Primiano, Chief of the Division of Planning and Development at DEM, is working to secure funding for a plan to raise the height of the causeway above the high tide line, eliminating the drowning risk. “So things are moving along as quickly as they can with an environmental project,” McNamara said. The RI DEM is now proceeding with a property survey of the causeway at Salter Grove to determine the type, amount, and cost of materials for its repair. They will also look to provide some marsh restoration as part of any project in this area, similar to that at Goddard Memorial State Park’s new boat ramp. A likely source of funding for this repair project has been identified. After the survey is completed in about a month, DEM will prepare more detailed plans and provide them to the City of Warwick, FoSG, and other interested parties prior to finalizing any plan. Harbor seals can be found sharing the water with container ships near the busy docks of the Port of Providence. Photo by Jason Major, Nov. 2015. Narragansett Bay and the inflowing waters of the Providence River weren’t always as clean as they might appear today. It wasn’t very long ago at all that discharge from RI’s many industrial companies flowed directly into the Bay, polluting the waters and inciting the growth of harmful algae and bacteria—not to mention creating some interesting smells around many of the Bay’s inlets and coves. 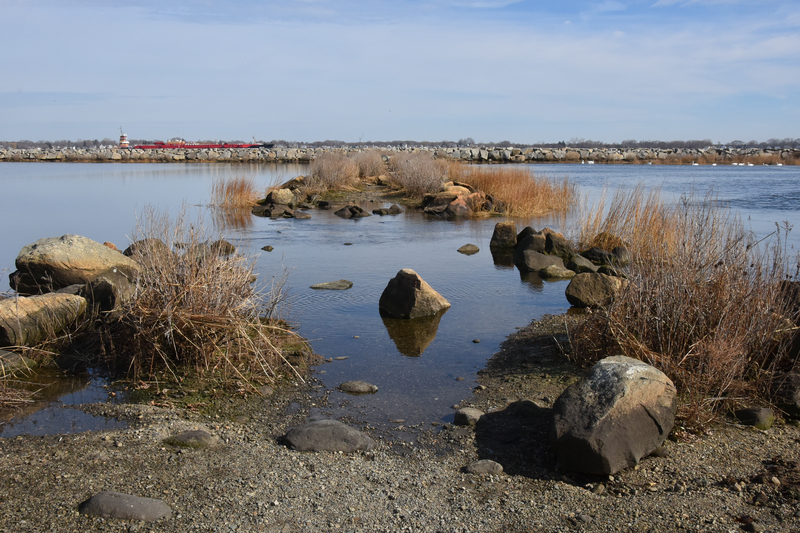 Thanks to the efforts of organizations like Save the Bay, forward-thinking city planners, and environmental regulations like the 1972 Clean Water Act, Narragansett Bay is in better shape than it has been in ages, but there’s still a lot of work to be done. FoSG charter member Mary Grady has covered this ongoing story in a recent article for R.I. Monthly—read the full article here.